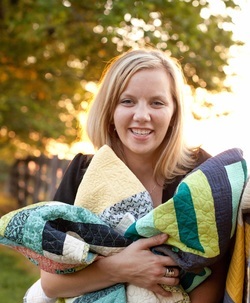 Angela Walters loves all things related to quilting! Her husband’s grandpa taught her the art of quilting by helping her make her first quilt, a 9 patch quilt that is still on her bed today. She is still quilting, of course, and has written several books, including “Free-Motion Quilting with Angela Walters”, “In the Studio with Angela Walters” and the “Free-motion Quilting Workbook.” She loves to give lectures and teach quilting classes. She also designs fabric. In her personal life, she is mother to three adorable children, wife to her awesome husband for over 13 years, and confirmed coffee addict. And of course, Grandpa’s Girl. The title of Angela's lecture accurately sums up Angela Walters’ journey from fast food employee to professional machine quilter. Using her quilts, Angela Walters will tell her quilting story. It’s a little funny, a bit entertaining, and hopefully, very inspiring. This lecture includes practical tips for deciding what to quilt on your tops with some time for questions. Click on this line for information about the workshops with Angela on Friday and Saturday.